A traditional bar turning division of contouring machines is made up of operators who lean on their expertise and can adapt their traditional production methods to today's requirements for quality or innovative material and enables us to produce parts Ø4 of the Ø32 mm on any type of material. The machining on single spindle lathes is called traditional or conventional bar turning because it uses mechanical machines as opposed to numerically-controlled turning. 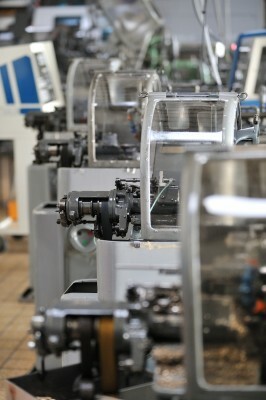 In fact, these machines, by their simplicity and robustness enable very good production rates. These lathes can be used to produce simple parts in medium to large runs at very competitive prices. Off-plan turning of high-tech pieces is at the heart of the company's business. Each employee develops, shares and communicates this knowhow to ensure the quality of your parts.